← Day 3 – Tuesday 20th January – a heartbreaking day. 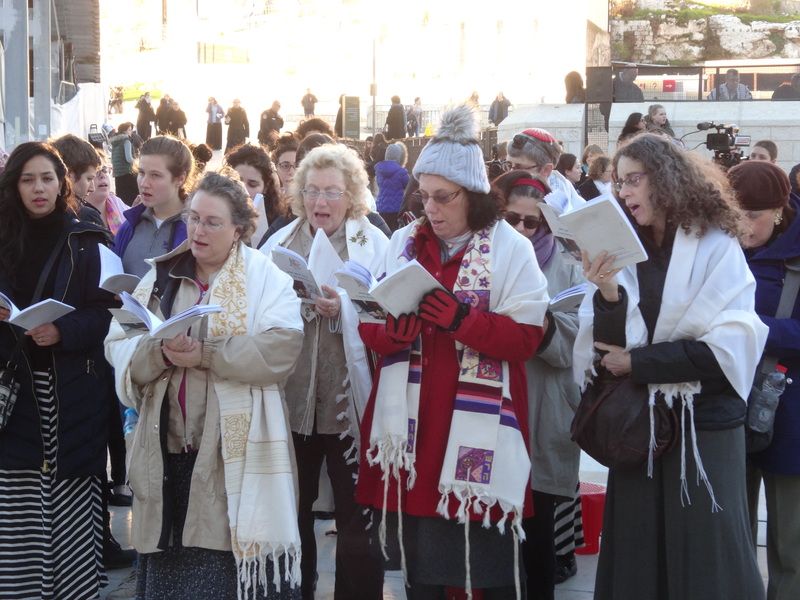 At 7am we joined the Women of the Wall Rosh Chodesh gathering at the Western Wall. Women of the Wall, or Neshot Hakotel נשות הכותל in Hebrew, is a group of Jewish women from around the world who strive to achieve the right, as women, to wear prayer shawls, pray and read from the Torah collectively and out loud at the Western Wall (Kotel) in Jerusalem. The Western Wall is Judaism’s most sacred holy site and the principal symbol of Jewish peoplehood and sovereignty, and Women of the Wall work to make it a holy site where women can pray freely. It was a good experience in that it was the most beautiful morning and there was a sense of real spirituality about these women. I felt totally accepted as one of them and I suppose that I am as I have the so-called ‘Right of Return’. But I was aware that we were not far away from many people who do not even have the right to remain in this land, let alone the right of return. If I were to come and live here, it would be at the expense of one of them. It felt all too easy to enjoy my acceptance and forget the ‘other’, which is, of course, what many do. The rest of the day was spent in the company of Breaking the Silence http://www.breakingthesilence.org.il. a group of former IDF soldiers who speak about their experiences of serving in the IDF. 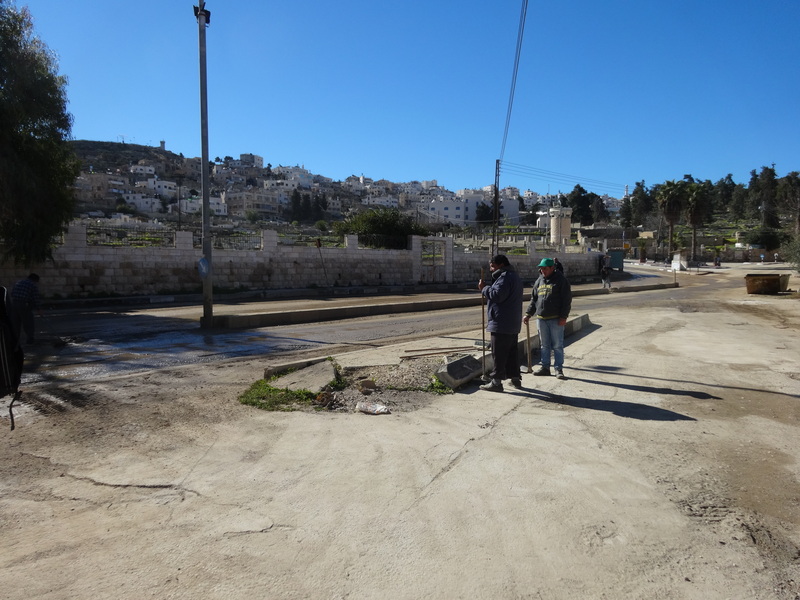 We were taken to Hebron, which is seen as a microcosm of the Israel/Palestine conflict. The map, above, shows how the city was divided, not after the Palestinians had committed a massacre of Israelis, but after an Israeli settler, Baruch Goldstein, murdered 29 Palestinians at prayer in the Old City Mosque in 1994. The Old City was the very heart of Hebron commerce and contains the Ibrahimi Mosque, which houses the Cave of the Patriarchs that is dear to both Muslims and Jews. The Mosque was subsequently also divided. Hebron is the second largest city in the West Bank and the only one which has an Israeli settlement inside it which is home to approximately 500 permanent residents. 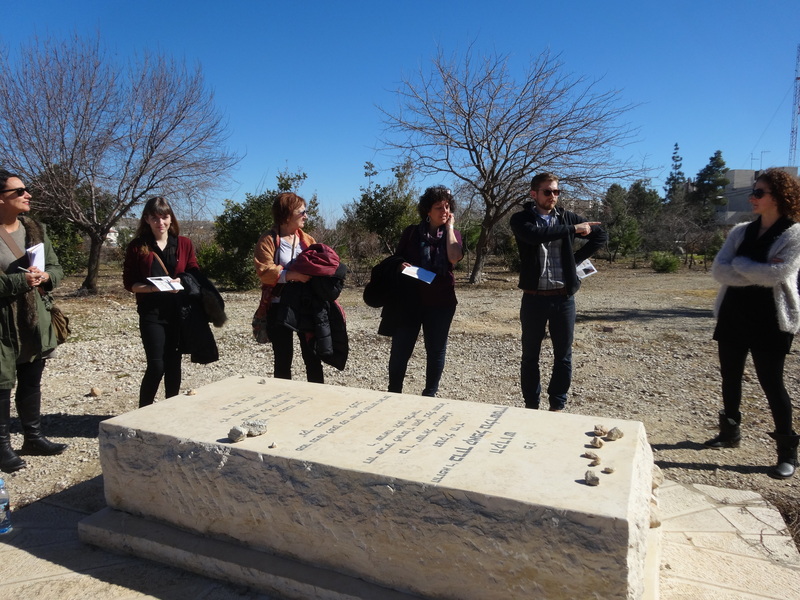 We were guided by 2 ex-combatants who first of all took us to the tomb of Goldstein who is still seen as a hero by many settlers. We then went to the most famous street in the West Bank in the heart of Hebron, called Shuhada Street. This road is famous because all of it is closed to Palestinian vehicles and part of it is closed to Palestinian pedestrians, even those who actually still live on the street! It means that the few who still remain there have to climb over their roofs or make holes in neighbouring property to leave their homes. The photo above shows Shuhada Street as it is today and as it once was, with Palestinian shops sealed and little or no traffic except that of the settlers who inhabit it. On this occasion we were surprised to see a few Palestinian men working on the road. That was not a cause of hope, but a sad reflection on the fact that there is little employment for them in Hebron now and they are reduced to working for those who have destroyed their livelihoods. Just down the road from this centre is the infamous Checkpoint 56, through which many Palestinians have to go on a daily basis to get shopping, go to school, visit friends or do any of the n ormal activities that most people can do without hin der. The two photos show each side of it as it is now. The people from Breaking the Silence were not allowed to enter H1, the Palestinian part of the city (as they are Jewish Israelis and in theory Jewish Israelis cannot enter Area A of the West Bank, which H1 is the equivalent of. However there are IDF incursions several times a month and I have seen them enter myself), so Hannah and I took our party through the checkpoint to show them life on the other side. One described it like walking through the Narnia wardrobe in ‘The Lion, The Witch and The wardrobe’! It is indeed like ente ring another world. From perpetual winter into Life. See the photo to the left. Within the area of The Old City where Palestinian trade still limps on there was a huge celebration going on. I asked what it was for and told that it was to celebrate the making of the French Muslim who saved the Jews in Paris, into a French citizen, and also a celebration of the peaceful nature of Islam! I wish I had been able to stay to enjoy it. For more information please do read the page ‘Hebron – Divided City’ and research on the internet. It is a huge subject. It was time to leave for Jaffa to meet with a group of Israeli and Israeli-Palestinian women involved in a dialogue group, including the director of Arous El-Bahar, http://arous-elbahar.org/he/ that was set up to support and empower women from the Arab community in Jaffa. We shared a meal with a Jewish, Christian and Muslim member of the group. They all agreed that it had been very helpful and supportive and that they had managed to remain together despite the Gaza war with had nearly destroyed their unity.